As I was exploring some research articles about Disney, I discovered the Disney College Program (DCP). Through my colleagues in the Hart School of Hospitality, Sport, and Recreation Management, Dr. Michael O’Fallon and Dr. Reginald Foucar-Szocki, I learned that JMU has sent many students to Disney, including Alexis “Lexi” Moyer , a senior majoring in hospitality management with a double minor in theatre and business. Lexi recently worked as a “FriendShip” boat captain at Walt Disney World. 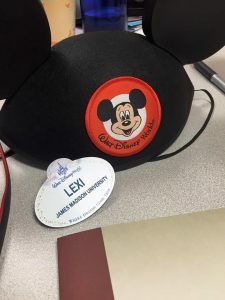 As an effort to help JMU students learn more about the DCP, I asked Lexi to share her experiences via a guest post on my blog. Thank you Lexi! The Disney College Program is an internship that college students from around the country, and even around the world, can participate in during their college careers. Working at Disney means you are a “Cast Member” rather than an “employee” and you have a “roles” rather than a “job”. Roles don’t always deal with your major, but sometimes they do. There are many different College Program (CP) roles that one can pursue. I’m a hospitality management major at JMU and Disney is one of the world’s biggest and best hubs of hospitality and tourism in the world. I’ve wanted to do the program since I found out about it on a school trip to Disney my sophomore year of high school. As a high schooler, I knew that Disney would feel like a home away from home once I went to college. I love Disney. I grew up watching Disney movies and the Disney channel, I played with Disney toys, and I am passionate about the brand. I spent my entire spring 2016 semester at Disney. Although it required that I push graduation back a bit, I absolutely do not regret this decision. In this guest blog post, I’ll share my perspectives on the application process, living the Disney life, housing, and life after Disney. 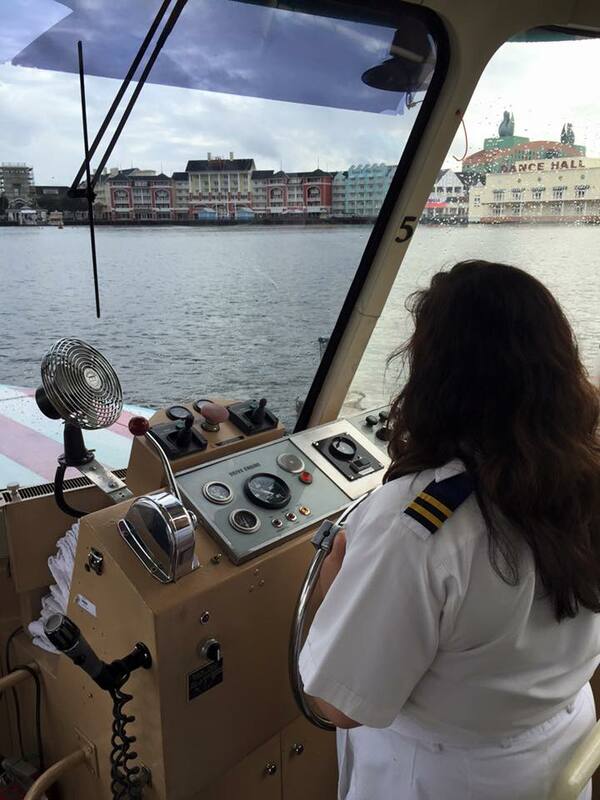 Alexis Moyer working as a FriendShip Boat Captain at Walt Disney World. The application into the program is a three-part process, and not everyone gets to join the program when applying. If denied, I recommend going back and trying again the following semester. The three parts are, the initial application form, a web-based interview, and a phone interview. The initial application form is just a general form about your work experience and to create your online account. There is also another section where you rank your desired roles by preference. There are several categories of roles that the main website will summarize and there are four ranking categories: “no interest,” “low interest,” “some interest,” and “high interest.” When ranking you want to carefully consider how many roles go in each category. If you put “low interest,” there’s still a possibility of receiving that role, so choose carefully. You also only want to put “high interest” for a small number of roles, or else Disney may think you have no focus. You’ll have to wait on an email from Disney regarding the results of the application to determine whether you move on or not. My wait was about 48 hours, but other College Program interns (a.k.a., CPs) have reported longer wait times. If you make it past the first screening, the second application form is a “web-based interview,” and it’s a general personality test. They ask situation-based questions about guest service, your personality, and how to handle situations. I watched a lot of Disney videos and read a lot of blogs and learned that Disney wants students who have opinions and are strong in their beliefs. Thus, based on my research, I chose “strongly agree” or “strongly disagree,” and occasionally picked “neutral” for many of the questions. I avoided “agree” and “disagree” to show Disney that I had strong convictions. After the web-based interview I found the results out immediately, and moved on to the third interview. What role(s) do you feel most qualified for? Which roles are in your top three choices? Do you work better individually or in groups? Have you ever been to Disney World/Disneyland? What did you think of your stay there? I prepared by writing some bulleted notes on how I would answer the questions. I also wrote reminders to smile and be happy because if you smile, interviewers can hear it through the phone. The program timelines vary slightly, but generally there are four programs: Spring, Spring Advantage, Fall, and Fall Advantage. I completed the five month Spring Program, and had a chance to extend to seven months, but declined the opportunity due to an internship lined up at home. I feel like five months was just the right amount of time for me for the DCP, but others may feel that five months is not long enough to do everything. I believe that anyone can extend up to a full year in the DCP, but after that they must apply to transfer for a part-time/full-time/seasonal position within the company or leave the program. The beauty of Disney is that, they are always innovating and changing so many things in their business. I know that when I come come back to Disney, whether that be to work or to play, Disney will still be just as magical as ever. I was guaranteed 30 hours of work per week in my contract, but was asked to work more than 30 sometimes and was offered opportunities to work more than 30 hours. Many cast members joke that CP stands for “closing person,” and while this is seemingly true for some roles, it’s possible to get morning shifts as well. Many days you’ll see CPs playing in the parks as guests and later on working in those parks as cast members, or the reverse. When you’re at Disney, spend your time wisely. Play in the parks before work, go visit attractions in Miami, Clearwater, Daytona, Cocoa Beach, etc. while you’re super close to these areasl. Not doing these things are personally some of my regrets of my program. When balancing work and fun, don’t let one take over the other, if possible. Some people have been with the company for several years, including a manager of mine, Rafael. He’s been with the company in several roles for 36 years (and counting). The CP is a way of getting your foot in the door with the organization, but it also helps get your foot in the door with other companies. Disney owns a large assortment of companies, but influences so many other businesses as well. Just putting that you have previously worked for Disney tells future employers that you’re the cream of a crop, you were chosen out of thousands of students who applied, and you completed the program. It tells future employers that your guest service and customer interaction is top notch. And best of all, it tells future employers that you will do anything to make a guest happy (not satisfied, but happy and yes, there is a difference). On resumes, it’s easy to phrase what you did at Disney to show potential fit with other careers. As an an example, I’m interested in hospitality, so my resume phrases my Disney boat captain experience around three of the four Disney keys: safety, courtesy, and show. As another example, my fellow CP boat captain wants to pursue a future career in transportation dealing with statistics. On his resume, he phrased his Disney boat captain experience to include numbers and facts about how many people were moved around on boats, transportation times, and capacity rates. 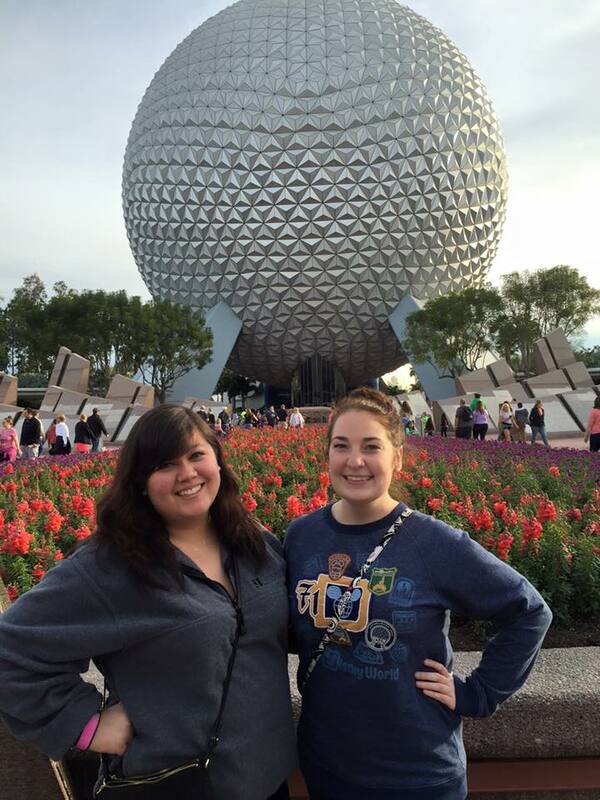 Alexis Moyer (James Madison University) and Allison Cheek (California University of Pennsylvania) enjoying some time off during the Disney College Program (DCP). While I was sad to see the end of my College Program, I think it helped me professionally and personally. As Winnie the Pooh says “how lucky am I to have something that makes saying goodbye so hard.” I learned so much about myself and what I want in my future, had met wonderful peers and connections like my roommate, Allison from California University of Pennsylvania who worked with food and beverage, and had gained wonderful insight into the professional world that is Disney. For anyone inspired to join the DCP family, I would be happy to make professional connections with you on LinkedIn at Alexis “Lexi” Moyer. Hope to hear from you real soon!